Ever since I was a small child, my life seemed to be filled with torment. I would often have seizures in which I would roll on the floor. Sometimes furniture would get knocked over. When these attacks came, it felt as if something was entering me. My mother who has long since passed away, had not control over me. I was like a wild and destructive animal. My father had to pin me to the floor until these attacks stopped. I was getting into a lot of fights, too. Sometimes I started screaming for no reason. And eventually my parents were ordered by school officials to take me to a child psychologist, or else I would be expelled. I had to go to this psychologist once per week for two years. Yet the therapy sessions had no affect on my behavior. I continually worried and frightened my parents because I behaved so strangely. At times I would go the entire day without talking to them. I would stay in my room talking to myself. My parents could not reach me, not even with all their love. Many times I saw them break down and cry because they saw that I was such a tormented person. Thoughts of suicide often came into my mind. Sometimes I spent time sitting on a window ledge with my legs dangling over the side. We lived on the 6th floor of an old apartment building. When my dad saw me doing this he would yell at me to get back inside. I also felt powerful urges to step in front of moving cars or throw myself in front of subway trains. At times those urges were so strong that my body actually trembled. I remember that it was a tremendous struggle for me to hold on to my sanity. I had no idea what to do and neither did my parents. They had me talk to a rabbi, teachers and school counselors, but nothing worked. When I was fourteen my mother was stricken with cancer and within several months she was dead. I had no other brothers or sisters, and so it was just me and my dad. He had to work ten hours per day, six days per week. So we spent very little time together. For the most part, my mother was my source of stability. With her now gone, however, my life quickly went downhill. I was filled with anger at the loss of my mom. I felt hopeless and my periods of depression were more intense than ever. I also became even more rebellious and began to cut out of school. I got out of the service in 1974 to start life again as a civilian. All my friends that I knew before had either married or moved away. So I found myself alone and living in New York City. In 1975, however, I met some guys at a party who were, I later found out, heavily involved in the occult. I had always been fascinated with witchcraft, satanism and occult things since I was a child. When I was growing up I watched countless horror and satan-type movies, one of which was Rosemary’s Baby. The movie in particular totally captivated my mind. I am utterly convinced that something satanic had entered into my mind and that, looking back at all that happened, I realize that I had been slowly deceived. I did not know that bad things were going to result from all this. Yet over the months the things that were wicked no longer seemed to be such. I was headed down the road to destruction and I did not know it. Maybe I was at a point where I just didn’t care. Eventually I crossed that invisible line of no return. After years of mental torment, behavioral problems, deep inner struggles and my own rebellious ways, I became the criminal that, at the time, it seemed as if it was my destiny to become. Looking back it was all a horrible nightmare and I would do anything if I could undo everything that happened. Six people lost their lives. Many others suffered at my hand, and will continue to suffer for a lifetime. I am so sorry for that. In 1978 I was sentenced to about 365 consecutive years, virtually burying me alive behind prison walls. When I first entered the prison system I was placed in isolation. I was then sent to a psychiatric hospital because I was declared temporarily insane. Eventually I was sent to other prisons including the infamous “Attica”. As with many inmates, life in prison is a struggle. I have had my share of problems, hassles and fights. At one time I almost lost my life when another inmate cut my throat. Yet all through this – and I did not realize it until later – God had His loving hands on me. Still this man persisted and we became friends. His name was Rick and we would walk the yard together. Little by little he would share with me about his life and what he believed Jesus had done for him. He kept reminding me that no matter what a person did, Christ stood ready to forgive if that individual would be willing to turn from the bad things they were doing and would put their full faith and trust in Jesus Christ and what He did on the cross, dying for our sins. One night, I was reading Psalm 34. I came upon the 6th verse, which says, “this poor man cried, and the Lord heard him, and saved him from all his troubles”. It was at that moment, in 1987, that I began to pour out my heart to God. Everything seemed to hit me at once. The guilt from what I did… the disgust at what I had become… late that night in my cold cell, I got down on my knees and I began to cry to Jesus Christ. More than eleven years have gone by since I had that first talk with the Lord. So many good things have happened in my life since. Jesus Christ has allowed me to start an outreach ministry right here in the prison where I have been given permission by prison officials to work in the “Special Needs Unit” where men who have various emotional and coping problems are housed. I can pray with them as we read our Bibles together. I get the chance to show them a lot of brotherly love and compassion. I have worked as the Chaplain’s clerk and also have a letter writing ministry. In addition, the Lord has opened ways for me to share with millions via TV programs such as Inside Edition in 1993 and A & E Investigative Reporter in 1997, what He has done in my life as well as to warn others about the dangers of getting involved in the occult. I have also shared my testimony on several Christian TV programs such as the 700 Club in 1997, and the Coral Ridge Hour (Dr. James Kennedy) in 1999. For all these opportunities I am most thankful, and I do not feel I deserve this. One of my favorite passages of Scripture is Romans 10:13. It says, “For whosoever shall call upon the name of the Lord shall be saved.” Here it is clear that God has no favorites. He rejects no one, but welcomes all who call upon Him. I know that God is a God of mercy who is willing to forgive. He is perfectly able to restore and heal our hurting and broken lives. I have discovered from the Bible that Jesus Christ died for our sins. Yet He was without sin. He took our place on that cross. He shed His blood as the full and complete payment God required for our wrong doing. The Bible also says, “For all have sinned, and come short of the glory of God”. Romans 3:23. Furthermore, it says, “For the wages of sin is death; but the gift of God is eternal life through Jesus Christ our Lord”. Romans 6:23. Friend, here is your chance to get things right with God. The Bible says, AIf you confess with your mouth that Jesus Christ is Lord, and if you believe in your heart that God has raised Him from the dead, you shall be saved. For with the heart mankind believes unto righteousness, and with the mouth confession of salvation is made”. Romans 10:9,10. So believe in your heart that these words from the Bible are true. I was involved in the occult and I got burned. I became a cruel killer and threw away my life as well as destroyed the lives of others. Now I have discovered that Christ is my answer and my hope. He broke the chains of mental confusion and depression that had me bound. Today I have placed my life in His hands. I only wish I knew Jesus before all these crimes happened – they would not have happened. 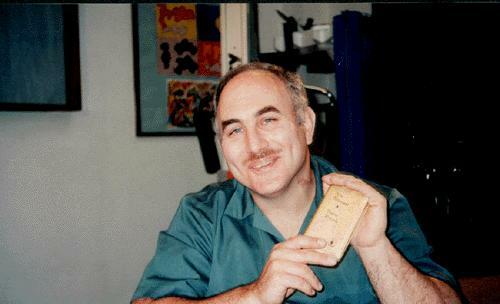 This entry was posted in Conversions, David Berkowitz, Testimonies and tagged conversion, David Berkowitz, former serial killer, son of hope, son of sam. Bookmark the permalink. I have a son who Pastors a small church in Thailand who sent me this article. and he’s right, what an amazing story of the Glory of ABBA YHWH. looks good on “paper” but im sure the families of the victims and survivors dont buy into it! Berkowitz needs to tell the truth and give names if he believes in GOD. Everyone knows he was not the only gunman/mastermind behind his senseless acts. Its time the others involved are brought to justice!